Parent Meeting: Sunday, January 27 @ 5pm in the Youth Worship Room. Please make every effort to attend the parent meeting for all students who are interested in attending camp. You can drop off your deposits and pick up any necessary forms. 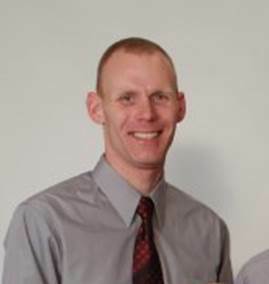 Jason Cook is deeply committed to faithful biblical preaching and that becomes obvious from anyone who sits under his leadership. He is a dynamic communicator obviously gifted by God to be able to minister to a wide range of people. Jason gives leadership to a church called Fellowship Memphis and travels the country sharing the incredible message of reconciliation that Jesus offers those who repent and believe. He was born and raised in Birmingham, AL in a home that feared God. At the age of 8, he walked down an aisle, as he wanted to avoid hell. After a successful high school football career, he graduated from high school in Northeast Atlanta and accepted a football scholarship to Ole Miss. It was at Ole Miss that he came into a true knowledge of Jesus and began the wonderfully arduous adventure of following Him. He was a standout at The University of Mississippi and was a member of the Baltimore Ravens Football Club during the pre-season of 2009. He ultimately walked away from the game of football to pursue the call to evangelism. He and his wife Courtney live in Memphis, TN with their growing family. Although Isaac Pittman has a voice that makes music sound easy on the ears, his life hasn’t always been a lullaby. At the tender age of six years old, he lost his biggest fan when his mother passed away. Shortly after, the music he loved as a child suddenly came to an end. It was then he realized music was God’s calling for his life and he believed in sharing the legacy of his family with this newly ignited passion he held inside. From that point on he dedicated his life to sharing his voice with the world. ISAAC has had the privilege of sharing the stage with other artists like Brandon Heath, Jars of Clay, Bethany Dillon and Shane and Shane. Currently, ISAAC travels the nation leading worship at a variety of gatherings. $65 Deposite due February 1st. Yes! The theme is REDEFINED. Students will serve with our North American Mission Board church planting partners in neighborhoods within driving distance from Wheaton. Students will serve in a variety of ways; from backyard bible clubs, to light construction, to neighborhood mapping. Everything they do will serve to see the Gospel proclaimed and the mission of the church strengthened. Lunch will be served on site. Posted in Events, Resonate and tagged camp, chicago, Resonate, Students, summer camp on November 28, 2018 by Patrick Greer. Disciple Now (DNow) is one of our most important events of the year in the Student Ministry at Lone Oak First Baptist Church. Traditionally DNow has been a weekend event in the spring when we take our students to Jonathan Creek for a three day action and spirit packed adventure diving into God’s Word together. This year, however, we have decided that such an important event in the lives of our students deserves much more than just the three day weekend of March 17-19 – and we want YOU to be a part of it! 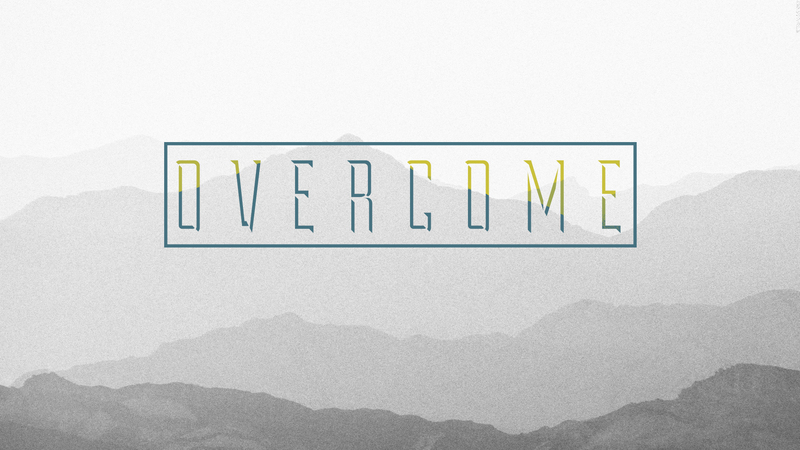 for our DNow Wednesdays as we dive into our theme – OVERCOME. We believe this would be an outstanding opportunity for all of us to learn and be reminded how to OVERCOME through the power of God who is present in our lives. Our hope is to not only ignite our students to desire to know God and His power to OVERCOME in Christ, but also to ignite the whole family to live in the power available to us through the Holy Spirit. For four weeks, we will hear testimonies from men and women who have OVERCOME life’s challenges through the power of Christ in their lives. Although they have faced some of life’s toughest storms, their faith in God has remained. Last month, through Dr. Dan’s sermons, God reminded us that we were not only given talents and gifts to be used by him, but also a story. Come join us as we hear the stories of how God refines and strengthens our faith as we OVERCOME in him. A finger stick test during Jeff and Stacie Richard’s son, Nate’s, five year old wellness checkup revealed that Nate’s hemoglobin was low. Days later, they were called in and given the devastating news that Nate had cancer. Nearly 2 years into the 3 1/2 year treatment schedule to keep his leukemia at bay, Nate became ill with an infection that his body could not withstand and he passed on to heaven June 24, 2009. In the midst of this tragedy, Jeff and Stacie continue to see God’s grace as Nate’s Wish, a foundation started to help children fighting cancer as well as encourage their families, is carried out. It is their hope that Nate’s Wish encourages every child and teaches them that they are one of a kind and they are wonderfully made. Daniel has no doubt his recovery from a near-fatal fall almost 6 years ago is a miracle. The then 36-year-old Dunn, an avid outdoorsman, was hiking on Memorial Day at Burden Falls in southern Illinois when his life changed forever. In an attempt to rescue a friend who was falling, they both fell 75 to 100 feet over the waterfall. Daniel sustained multiple life threatening injuries including a fractured skull and vertebra. The accident has given him a heightened awareness of the importance of sharing God’s love with others. Brian’s story is a story of redemption, God’s grace, and faith. After years of struggling with alcoholism in private, God’s circumstances forced Brian to deal with his demons. Brian entered into rehab. It was here, during one of the hardest challenges of his life, he overcame his addiction through the power of Christ. While Brian still affirms alcohols effects on him today, he overcomes this temptation through the help of family, friends, and most importantly his faith in God. On December 1, 1997, a 14-year-old freshman boy who had been bullied for years walked into the Heath High School lobby and randomly fired a .22-caliber semi-automatic pistol. Three students were killed. Five were injured. Missy was one of the critically injured students. She was left paralyzed from the chest down. But just hours after the shooting, Missy did the unthinkable: she forgave the shooter, accepted her disability and reclaimed her life. Missy’s story is one of love, faith, forgiveness, courage, and determination. at Jonathan Creek Camp and Conference Center. in their new Worship Center. Thank you for your commitment to pray and support the high school and middle school students at Lone Oak First Baptist Church. We look forward to all God will do in the month of March, as we all learn that we too can OVERCOME! Posted in Amplify, Events, Parents, Resonate and tagged disciple now, dnow, jonathan creek, overcome, parents, Students on February 15, 2017 by Patrick Greer. 2 – Students accepted Christ!!! Pictures and the Highlight video will be uploaded later this week! Posted in Amplify, Events, Parents, Resonate and tagged Amplify, Bible, camp loucon, discipleship, dnow, High School, middle school, move2016, Resonate, Retreat, Students, teenagers, tom richter on March 20, 2016 by Patrick Greer. 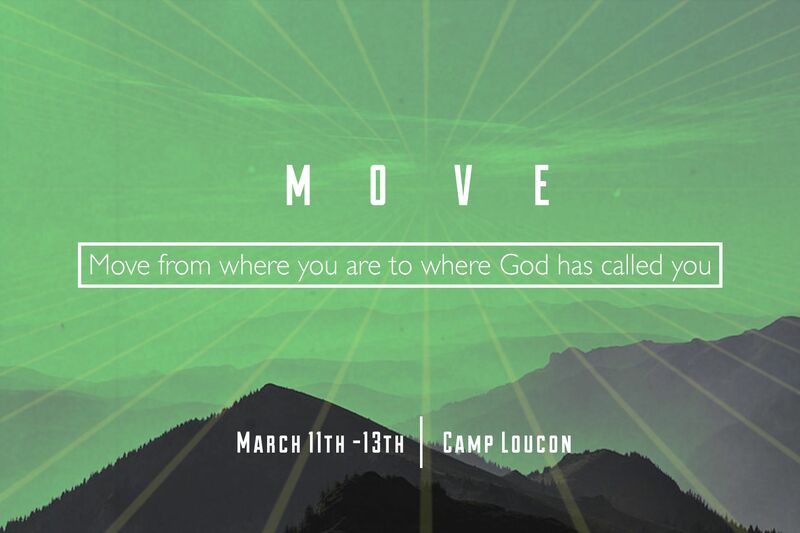 Posted in Amplify, Events, Resonate and tagged camp loucon, dnow, High School, middle school, move, Retreat, Students, tom richter on February 20, 2016 by Patrick Greer. Over the past 3 weeks, we have been participating in a movement of students to UNITE for the Gospel in Paducah, KY. Starting at Paducah FBC, churches in McCracken County UNITED together to encourage one another to take the Gospel into our community. Last night was the third and last UNITE service hosted here at Lone Oak FBC. Over 200 students and adults joined together to play games, worship, and be encouraged from God’s Word. What was started 3 weeks ago will culminate Saturday as we meet together again to share the Gospel at KY Oak Mall. Unlike anything that has ever been done before in McCracken Country, students will UNITE to be trained and commissioned to go into KY Oaks Mall and share the Gospel with the people they meet. We (Lone Oak FBC Student Ministry) will meet at Lone Oak FBC at 9:30am to load buses and head to 12 Oaks Baptist Church for the evangelism training. 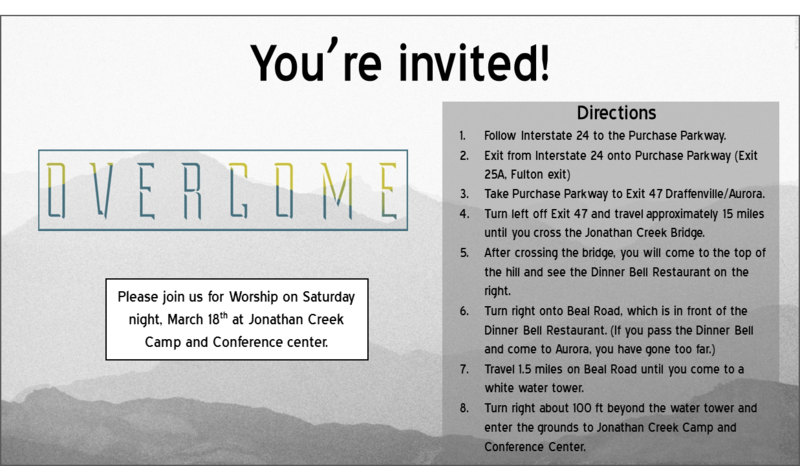 There we will join students from other churches before going to KY Oaks Mall. Lunch will follow. For details see the schedule below. It is our prayer that this movement will go beyond a few services and see our community changed for the Gospel. Posted in Amplify, Events, Resonate and tagged gospel, High School, Ky Oaks mall, Lone Oak FBC, mccracken, middle school, paducah, Students, UNITE, unite for the gospel, unite in communty, unite in prayer, unite in service on November 5, 2015 by Patrick Greer.